Jenners Southern Frames furniture factory used to be in Newtown Road Hove, opposite the old Goldstone Ground south stand. Dickie Bennett, John Keary, Bob Palmer, Ron Birch ,Ken Norris, Brian Birch and Terry Kirby. If you recognise yourself or anyone else here, please leave a comment below. My mother Irene Searle worked for Jenners as a fabric machinist making the soft furniture covers and cushions. I recognise Ron and Brian Birch as I lived in Godwin Rd and they lived in Egmont Rd on the Knoll Estate. I was in the same class at the Knoll School as their younger brother Kenny. 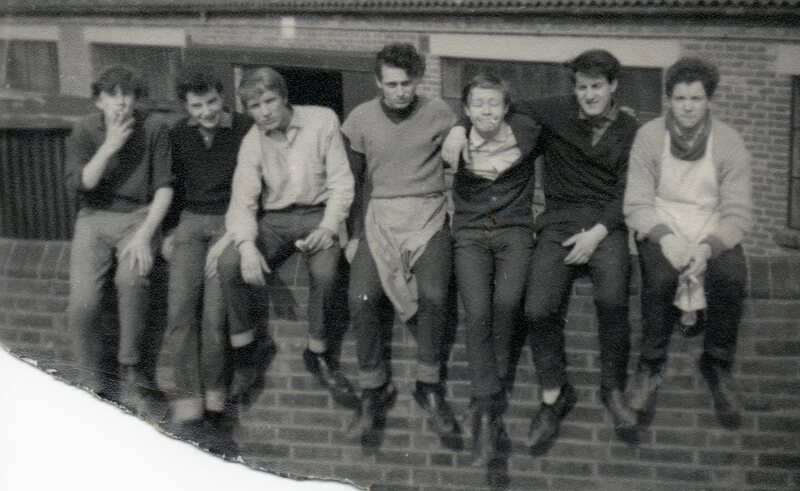 In 1964 I was in the Merchant Navy and came home from the West African Coast for the Summer. I am now a Canadian Citizen living in New Brunswick, Atlantic Canada. That’s my dad, Bob Palmer. My dad worked at Jenners as an upholsterer in the 50s and 60s. His name was Bill Newman. I remember him talking about Ron Birch and Ken Norris. He worked at most of the upholstery firms in Brighton & Hove in the 70s. Anyone remember him? I used to work there in 1971/72 for a few months before I returned to Northern Ireland. I was 21 then – I loved it. I was so sad to leave.